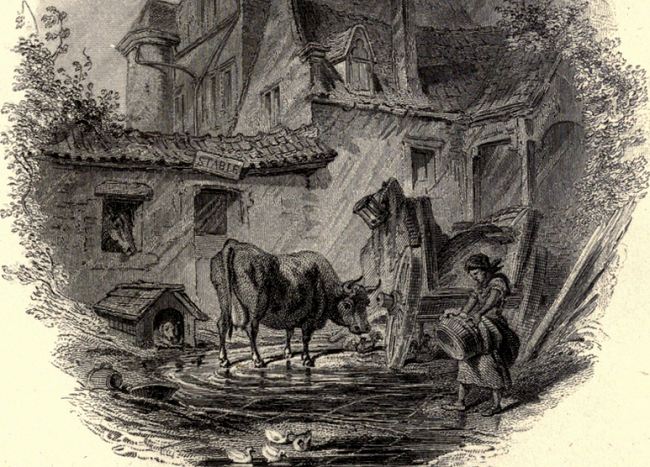 “I know of nothing more calculated to make a man sick of this world than a stable-yard on a rainy day.” Illustration by Karl Hermann Schmolze for “The Stout Gentleman” in the 1858 Putnam edition of Bracebridge Hall. In 1821 Washington Irving and his British publisher, John Murray, were eager to profit from from the extraordinary reception accorded The Sketch Book of Geoffrey Crayon, Gent., which had appeared serially between June 1819 and September 1820. An international hit, the collection included Irving’s two most famous tales, “The Legend of Sleepy Hollow” and “Rip Van Winkle,” as well as the cycle of stories that would later be known as “Old Christmas.” Until the early weeks of 1822 Irving worked feverishly on a sequel while he was traveling through France and England. The resulting volume, Bracebridge Hall, contained fifty-one tales and sketches set in and around a manor modeled in part after Aston Hall, the estate that had provided the setting for his earlier Christmas stories (and that can still be visited in Birmingham, England). The next day it rained unceasingly, and we were confined to the inn, like the nervous traveller whom Irving has described as spending a day in endeavouring to penetrate the mystery of “the stout gentleman.” This wet Sunday at Oxford did, in fact, suggest to him that capital story, if story it can be called. The next morning, as we mounted the coach, I said something about a stout gentleman who had come from London with us the day before, and Irving remarked that “The Stout Gentleman” would not be a bad title for a tale. As soon as the coach stopped he began writing with his pencil, and went on at every like opportunity. We visited Stratford on Avon, strolled about Charlecot Park and other places in the neighbourhood, and while I was sketching, Irving, mounted on a stile, or seated on a stone, was busily engaged with “The Stout Gentleman.” He wrote with the greatest rapidity, often laughing to himself, and from time to time reading the manuscript to me. We loitered some days in this classic neighbourhood, visiting Warwick and Kenilworth; and by the time we arrived at Birmingham, the outline of “The Stout Gentleman” was completed. Notes: An upper Benjamin (page 62) is a type of overcoat. The word ycleped (p. 63) is an archaic word meaning “named” (e.g., a cat ycleped Whiskers), while slammerkin (p. 65) is an old slang word for a slattern. Belcher handkerchiefs (p. 67) were multicolored neckerchiefs named for the boxer Jim Belcher. The phrase sworn at Highgate refers to a popular custom at pubs in the village of that name, where travelers would swear nonsense oaths (such as “I shall not drink small beer while I can get strong”) while holding a ram’s horn attached to a five-foot pole. It was a rainy Sunday, in the gloomy month of November. I had been detained, in the course of a journey, by a slight indisposition, from which I was recovering; but I was still feverish, and was obliged to keep within doors all day, in an inn of the small town of Derby. . . . If you don't see the full selection below, click here (PDF) or click here (Google Docs) to read it—free!